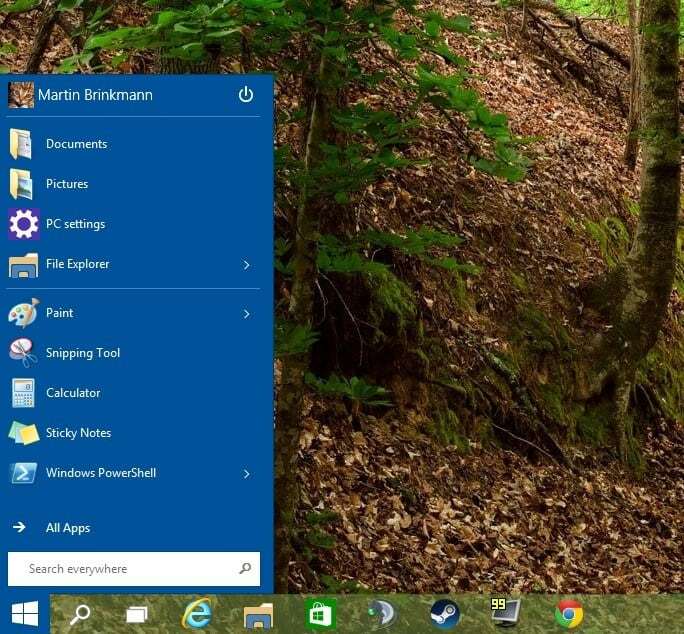 The Windows 10 Preview is out and interested users can download ISO images or an upgrade executable file to install Windows 10 as a standalone operating system or upgrade an existing version of Windows instead. You can install Windows 10 in a virtual machine for example if you don't want to mess with a current installation of Windows. With that said, the preview's core audience are businesses and tech experts and it is not recommended to upgrade a desktop system to Windows 10 just yet. The preview build resembles Windows 8.1 in many ways and can easily be confused with that operating system. The functionality remained the same in many areas which can be explained by the short development period. There are changes however and this guide looks at the most important ones. You may have read about some already while others may be new to you. I have mentioned the start menu before and don't want to get into too many details again. Only this much: you can remove all live tiles and tiles from it you don't want to use them. This is done with a right-click and the selection of "unpin from start". It is furthermore possible to make the Start menu the default so that the Start screen itself is not used anymore. To do so, right-click on the taskbar and select properties from the context menu. The only difference between both modes is what a click on the start icon or a tap on the Windows-key does. I had to enable the Start Menu after upgrading to Windows 10 from a Windows 8.1 test system. 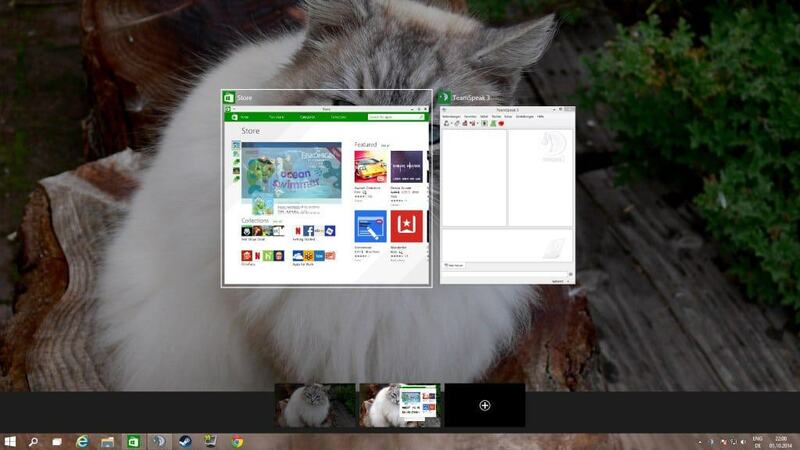 Microsoft started to display window borders in Windows 8.1. This seems to have been in preparation for launching apps in windows instead of fullscreen. 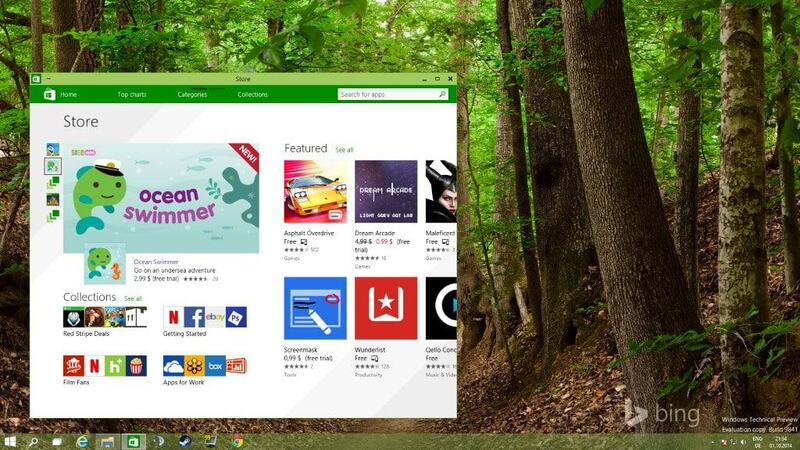 You can resize app windows and run them like any other desktop program. You may notice some odd behaviors though, like horizontally scrolling windows instead of vertically scrolling ones. The command prompt has not changed a lot, but the ability to copy and paste directly using Ctrl-c and Ctrl-v is a welcome addition which should improve it significantly for users who use it regularly. 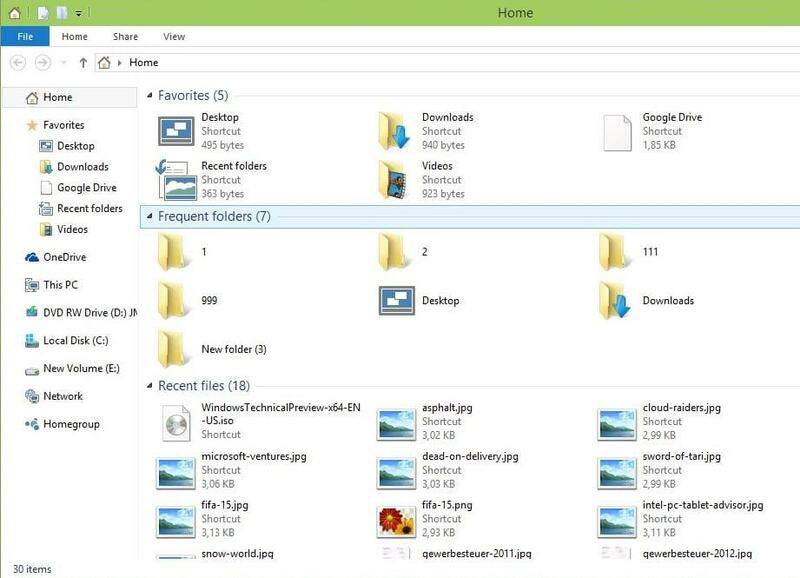 File Explorer, the system's default file browser, displays a new Home screen on start. Here you frequent folders and recent files listed as well as the system's favorites. It is a simple change but one that can speed things up for some users. Just saved a file to the system and cannot find where? Just open the Home screen and you see it listed there. Another new feature is the Task View. When you click on the Task View icon or use Alt-Tab, thumbnail images of all open windows are displayed on the screen. You can use it to quickly switch to another window or check what is open and what is displayed in it. The thumbnail representations of open windows are updated in real-time. When you click on the Search icon next to start, another search interface opens. Here you find listed trending searches (pulled from the web it seems), and a list of recent searches you made. This search module displays the same results that the start menu or start screen search produces. The only explanation that I have for it being there is that it provides users who use the Start Screen interface with options to search on the desktop. Should be removed automatically when you switch to the start menu in my opinion. This feature is not explained anywhere and users may not even realize it is integrated into the preview. Press Windows-Tab to display all desktops that are currently available and options to remove or create desktops. Opened windows are displayed using the Task View feature when you use the shortcut. Desktops are displayed as thumbnails when you do so and you can either switch between them with a click on a thumbnail or by using Ctrl-Windows-Left or Ctrl-Windows-Right to cycle through them. I was not able to find out if there are shortcuts to switch to a specific desktop right away. The integration of the snap to side or maximize feature in Windows 7 was welcome by many users. Windows 10 improves upon that by adding more options to the process. It is possible now to snap windows in different ways now, for instance so that four are displayed at the same time using the same amount of space on the screen. Now You: What's your take on Windows 10 so far? Have you had time to test it yet? Really, GUI changes only which could be done by a simply patch for win2k and higher? Makes me smiling every time I read such things are called “new os”. – There is no watermake on enterprise?! Good finds. Charm Bar is still there though, but it does not seem possible to activate it using the mouse. The Search icon next to Start button could possibly be for Cortana voice search in the future? Is the Search icon removable, sort of like the icons are in ‘Quick Launch’ toolbar? Tim, a right-click does not display unpin options for it or the Task View feature. I tried it in a VM and I must say that I am pretty impressed with it (at least at first sight). First, it has a normal look when used on a desktop computer. And it seems to be lighter on resources (especially memory) when compared to Win 8. No Control Panel in Start Menu? Has Microsoft ever tried to change the name of the Start menu? I mean, Microsoft is no stranger to name changes. Hotmail becomes MSN becomes Live becomes MSN again, or maybe vise versa, I lost track. The Windows 8 interface was Metro or Modern or just plain Windows 8. Half their stuff seems to bounce between Bing and MSN or Live every year, like a child locked in a tug of war between divorced parents. So it’s weird that the Start menu was never re-branded. Especially considering all those “So I Start to Shut Down? !” jokes still apply in Windows 10. Downloading the x64 iso now, am going to load it onto an older machine (i3 3120M @ 2.50ghz) 4Gb, and 350Gb 5400rpm. I’m going to focus in areas like policies (suspecting not much change from 7 or 8), security, and imaging. Will I be able to create a full, bootable image with something like driveimage.xml? We shall see. I plan to also infect my copy with something like the NSA or FBI ransomeware virus to see how booting in safe mode or safe mode with networking will be affected by these whole system lock-down malware programs. Will look at the registry. Remember, the charm bar also had a companion, the switcher bar or switch list to toggle between apps. The hot corners which I found very irritating will also be looked for. Windows 10 looks great, the new features included should appeal to people I guess. Please say to Microsoft to make Windows 10 beautiful. the win 8 explorer theme is ugly. Microsoft can make 2 theme. one for fast and powerful systems, and one for slow and low systems. No chance I’ll come near this horrible thing. Impressed by how the start menu looks BAD. How that’s possible ? I’m not against square, at all, however I may be against flat dark blue splashing everywhere… Windows 8 apps zone were already plagued by that. Want to see if they fixed it in Windows 10. Besides of the never ending gui hype discussion here are some sources which sounds really really good and are reasons that I maybe upgrade from 7 –> 10. And I hope people can finally upgrade the OS via WUS, that would also be good (linux provide such kernel upgrades since years).